To wrap up Enquiro’s B2B Expert Series of webinars for this year, we’ve put together a special session on SEO and PR which is a “must-see” as you’re finalizing your 2010 marketing plans. 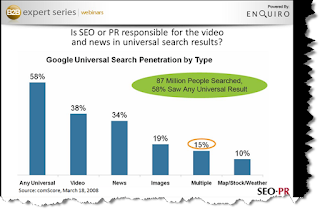 The webinar will be presented by Greg Jarboe, the president and co-found of SEO-PR. Greg has a history of speaking at SES (Search Engine Strategies), Marketing Sherpa Summits and other large SEO conferences. With More than 25 years experience in corporate communications, he has lots of insight to offer on public relations. A sound press release optimization component is a key factor of any blended search strategy along with image optimization, video optimization, local search optimization, and optimization of shopping feeds. Of course blended search also includes optimizing things like blogs and social media efforts as well. 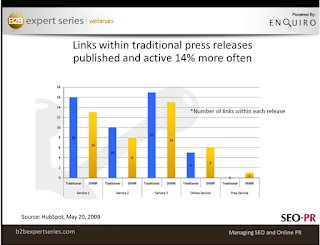 Greg is a great speaker and a well known advocate and visionary when it comes to optimizing press releases. Greg started out by discussing how PR has made a drastic shift to online. He cited how the NY Times picked up one of their press releases verbatim illustrating these recent trends. He touched on the importance of Google Universal Search (aka blended search) and how Google displays news results depending on the query of the searcher. If you have an online reputation management issues, PR optimization and universal results become increasingly important. Greg mentioned how images in Google universal search results change eye scanning patterns (based on Enquiro Research from 2007). 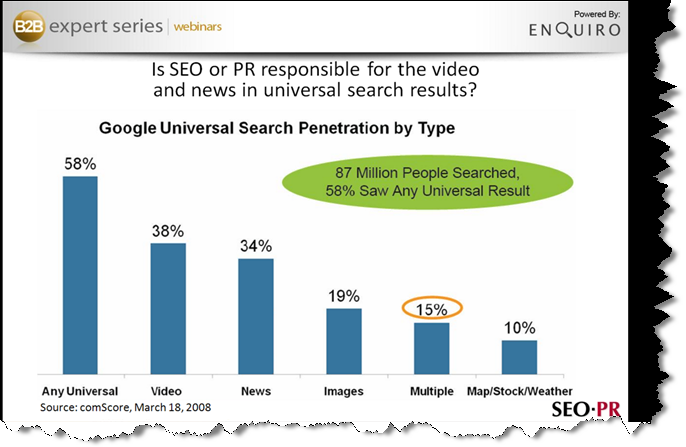 Based on ComScore data from March 2008, people are paying attention to blended search results 58% of 87 million people who searched in Google saw any type of universal result and in fact 34% noticed the news results as seen in the screenshot below. Greg went on to illustrate how an optimized press release ranked #1 in Google News (baby photo contest) which included an image. Greg suggested the importance on embedding videos in your press releases and discussed the role that YouTube plays where the video in the example got over a quarter of a million views and over 1,300 ratings in YouTube. Calls to the company increased by over 70% in less than a month thereby generating measurable results. Greg touched on additional ways to measure the impact for online PR. He showed how they have used resources such as compete.com data to measure visitors and participation based on the publicity generated from the online PR efforts. I posed the question of whether press releases should be hosted on your own site vs. that of a third party? (I know the answer to this btw). Greg suggested putting your press release on your own site, but also putting your news release on a newswire service to help it get communicated in the search aggregators. Wire services are need to get into the news engines. Greg suggested that PR Web was a great resource in the early days but now many of the services are SEO friendly. Greg finished up by mentioning the need to convince people that PR is important which is usually the result of a reaction to an issue, or until someone in the organization realizes they need to increase awareness. Again the need to measure the results and effectiveness of the PR. PR needs to be held accountable. 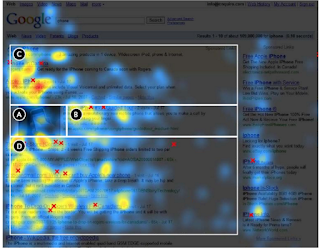 Use web analytics to determine where your referrers are coming from. News media or blogs are probably driving a lot of traffic to your sites. PR people need to be looking at analytics to understand this to see how they are generating qualified traffic to their web properties. For more information on Enquiro visit, www.enquiro.com.